Pen and brown ink with green, black, grey, red and blue washes; on two joined sheets of laid paper; 752 x 468. The attribution of this drawing to Henry Wise rather than Charles Bridgeman (as suggested by Willis) is on comparison with Wise's final presentation design for the Maestricht Garden in the Royal Collection (Roberts, Royal Landscape, Fig. 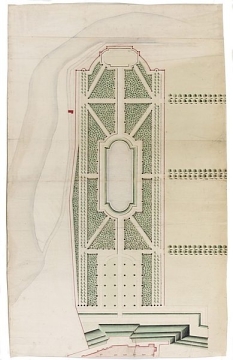 175), and with his design for the garden of Buckingham House, SM 111/42. Very similar shading and outline techniques are used on all three drawings. This plan is a close pair with Wise's final design in the Royal Collection. The only differences are in details of planting in the lower rectangular lawn area and the absence of fountains in the central lake. The Maestricht Garden was begun on the north-east side of Windsor Castle soon after September 1713, when Wise submitted an estimate of £6,874 'for levelling, new making and planting a division of ground on the North side of the Castle' (Green, Henry Wise, p. 83). An aerial photograph of 1964 (Roberts, Fig. 177) shows that a start was made on the alleys on the north side and bordering the lake. Work was abandoned soon after the accession of George I in August 1714. The length of the garden on this plan is 5650 feet and its width is about 2000 feet.